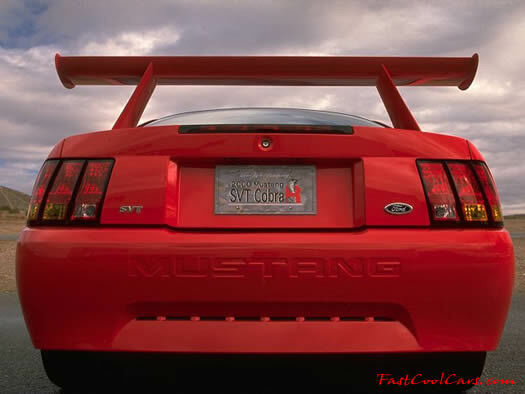 2000 Ford SVT Mustang Cobra R The spoiler just makes the whole package - wearing its production Performance Red paint, was displayed for the first time here today at the Specialty Equipment Market Association's (SEMA) annual convention. Built with the race track in mind, the Cobra R features a 5.4L 32-valve V-8 engine, solidifying the modular family of engines as the high-performance benchmark in Ford's lineup. The Cobra R V-8 produces an estimated 385 horsepower and 385 foot pounds of torque. In order to keep this power on the ground, the Cobra R features exterior enhancements including a front air-splitter and tall rear deck spoiler, which create down force for increased stability at track speeds.